HONG KONG, Oct 16, 2013 – DotAsia, the organization which oversees ‘.asia’ internet addresses, is for the first time releasing single and double character domain names. Rights holders and interested parties can benefit from priority access to register these valuable, premium domains. In a region where people commonly use English acronyms and short forms, the new DotAsia internet addresses offer a short and memorable brand identifier for global firms. Furthermore, the one and two character domain names enable international brands to safeguard their brand identities in the world’s most populous and fastest growing region. Keen to consolidate and extend their Asian presence, a number of organizations have already applied for the prized domains. One such organization is HR Asia, the region’s most authoritative publication for HR professionals. 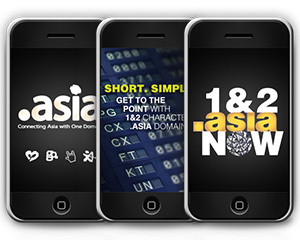 Businesses wishing to register their interest in a one or two character ‘.asia’ domain name should visit www.1.asia . As a not-for-profit organization, DotAsia strives to play a part in advancing Asia’s digital future with the proceeds from every ‘.asia’ address registered. DotAsia proactively contributes to, and participates in, regional projects that bridge the digital divide and promote digital equality, such as One Laptop Per Child (www.OLPC.asia) and NetMission (www.NetMission.asia).